The Basilica of Santa Croce, a Franciscan church, is the second most important church in Florence after the world famous Cathedral. Almost every other city in the world would be happy to have such an important church. 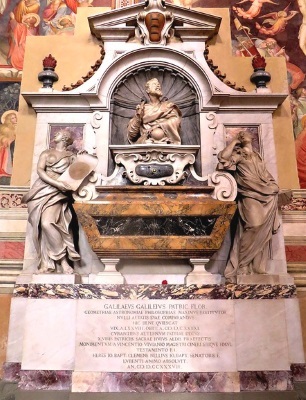 Among others, the Basilica of Santa Croce contains the tombs of Michelangelo, Galileo Galilei and Dante. In probably no other church in the world are so many important people buried. Santa Croce is translated into German as „Holy Cross“. So the church can also be called the Basilica of the Holy Cross. There are also snakes at the entrance in summer, but mostly not for hours as at some other sights in Florence, as at the cathedral or at the world-famous art museum Uffizi Florence. The Basilica of Santa Croce is a very large church with great large paintings on the walls. The colorful glass windows are also beautiful. Very famous is the crucifix of Cimabue from the late 13th century. One should also have a close look at the high altar. After visiting the Church of the Holy Cross in Florence, you can visit the Museum of the Basilica and some of its annexes with exhibitions. You will automatically pass behind the exit. Everything can be visited with an entrance ticket to the Basilica. 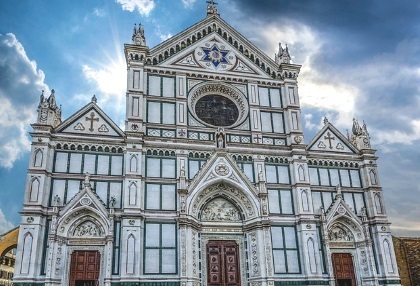 Admission to the Basilica, including the Santa Croce Museum in Florence, costs 8 euros for adults. Teenagers between 12 and 17 years pay 6 Euro, children up to 11 years do not have to pay the entrance fee. For example, disabled people with a companion do not have to pay admission. Family ticket: Families only pay the entrance fee of their parents, i.e. 16 Euro. The entrance is on the side of the church (well signposted). You pass through a small bookshop in front of the entrance and through the Basilica Museum, which is included in the entrance fee. Guided tours through the church are very popular. There are many things to see that are difficult for a layman to understand. An excellent guided tour (length about 90 minutes) in English or Italian can be booked on this website. Especially because of the graves, the Holy Cross Basilica is one of the great sights in Florence for us. The opening hours of the Church of the Holy Cross are daily from 9:30 to 17:30. On Sunday the church service etc. is only open from 14:00. This also applies to many holidays. Construction began around 1294 and the foundation stone is said to have been laid by the famous Francis of Assisi himself. It is the largest Franciscan church in Italy. The façade from the middle of the 19th century is neo-Gothic and made of marble. Many of the frescoes in the Basilica of the Holy Cross in Florence are by Giotto, but by far not all of them are included (the pictures of Giotto are from about 1320 to 1330, near the altar). 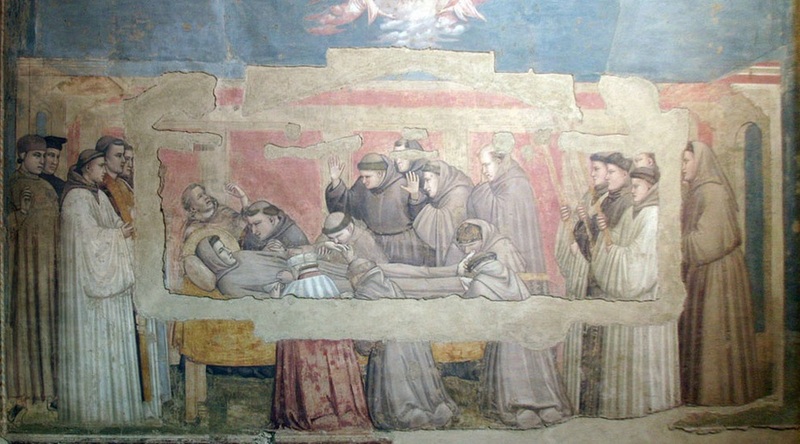 The picture below is the most famous fresco by Giotto in the Basilica in Florence called „The Death of Saint Francis“. Another important artist who created some works of art in the basilica is Donatello. 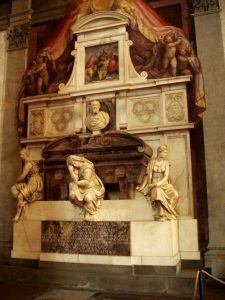 He created the crucified Jesus and the so-called Annunciation Relief in the church of Santa Croce. Some works of art in the basilica were severely damaged by a flood in 1966 and could only partly be completely renovated. The basilica has no steeple. The construction of a tower began in the 16th century. The church tower of Santa Croce was never completed and was demolished in 1854. Rules for Church Visitors: The Church of Santa Croce can only be entered in appropriate clothing. The use of mobile phones is prohibited. Photography with flash and / or tripod is not allowed. On 19 October 2017, a fatal accident occurred in the Basilica of Santa Croce in Florence. A tourist from Spain was beaten to death by a stone that came loose in the ceiling of the church. The church was then closed for a few weeks. During our visit in mid-November 2017, the Basilica was reopened for visitors. 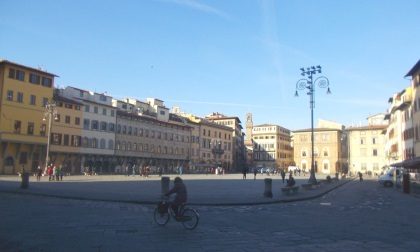 The square in front of the Basilica huge and belongs to the most beautiful city squares in Tuscany. Around Piazza Santa Croce in the old town you will find some good restaurants. There are some benches on the square. From there you have a great view of the beautiful white facade of the basilica. Next to the basilica on the square is the large Dante monument. Around the big church square Santa Croce there are some palaces worth seeing. The Palazzo dell Antella with some beautiful frescos is to be emphasized. St. Stephen’s Cathedral Vienna is the most famous church in Austria.